Like many of you, I usually cook three meals a day, 7 days a week. I don’t mind, really, but if there are ways to get thing done faster and cheaper and still serve quality meals to my family, I’m all for it. So, today I thought I’d share with you a few of my best time and money saving tips. I’m not going to mention things like meal planning because we all KNOW that is number one. 1. Buy your canned tomato products in bulk. Every year I set a goal to can enough dehydrated tomatoes, spaghetti sauce, tomatoes and onions, and salsa to last a year. I’ve yet to achieve that goal. So that means for at least a portion of the year I have to buy things like diced tomatoes and tomato paste. If I buy diced tomatoes at the grocery store I pay .79 for a 14.5oz can. I can buy a #10 can for under $4 at Sam’s – that’s 102oz. When I open the can, I scoop out what I need for that meal and then portion out the rest into wide mouth pint size mason jars. I put lids loosely on them and then put them in the refrigerator. The next day I move them to the freezer. I do the same thing with tomato paste, only I portion it out into snack size Ziploc bags. Many regular grocery stores also carry #10 cans of food. 2. Use bacon as a garnish not as a meat. We love our bacon around here but there are a lot of us. So when I get home from the grocery store, I immediately put the bacon in the freezer. If it stays in the refrigerator, it will all get eaten at one meal. When I want to make something with bacon, like eggs or kale salad, I take the bacon out of the freezer and cut an inch or two from the end – across all the slices. Right through the plastic. Then I put it in a ziplock bag and put it back in the freezer. For eggs, I fry the bacon and when it’s done pour the eggs in to scramble. So we get all the flavor, I don’t have to spend the time frying up an entire package of bacon and I get several meals from one package of bacon. 3. Use regular mouth canning jars instead of your blender carafe. I mentioned this in pesto preserving post. I learned from Heather, The Homesteading Hippy, that the blender blade and locking cap of many brands of blenders fit a regular mouth mason jar. Now, when just one person wants a smoothie, it gets made right in the glass he’ll be drinking it out of. This has been life changing, I tell you. 4. Make a big pot of pinto beans every couple of weeks. For us, big means a four pound bag of dried beans. This is my super secret survival trick. Every two weeks or so I cook four pounds of beans in my roaster oven. When they are done, I let them cool and then put them in containers and freeze them. I prefer to use these glass containers but I’ve also used old yogurt containers from store bought yogurt. With these beans I can make bean burritos, taco salad, chalupas and taco soup, to just name a few things. Also, it doesn’t take long to defrost beans in the microwave – which is always a plus. 5. Rotisserie chicken and boxed salad instead of fast food. It happens to all of us. There are just some days that don’t go as planned and it’s now dinner time and we have nothing fixed or even thawed – we may not even be home. We just want to eat and have the day be over. (Maybe that’s just me, but I have a feeling I’m not alone.) Sometimes our family just has popcorn for dinner on these nights. But if either Carl or I (or one of our children who drives) is in town, we’ll stop by the grocery store and buy a rotisserie chicken or two and some ready made salad. I KNOW it’s not as cheap as cooking at home but for about $15 I can feed our whole family something more nutritious than Little Caesar’s. I learned this from my (in real life) friend Kara from Home With Purpose. Your turn. 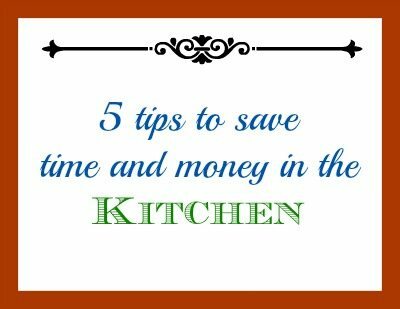 What are your best time and money saving kitchen tips or tricks? Great tips! I wish my family would like beans, but my kids would not even touch them. Love the tip with canned tomato products in bulk, thank you! I LOVE the canned tomato idea. I am totally doing that! And I love cooking up beans and using them throughout the week and having them in the freezer. It saves a ton over canned beans and they can stretch a lot of meals with a few pennies of ingredients. 🙂 Great article! Great ideas! I usually just dehydrate our herbs but I bet they would taste better frozen in olive oil. I’ll have to try the rice trick. We really love rice. Great tips! 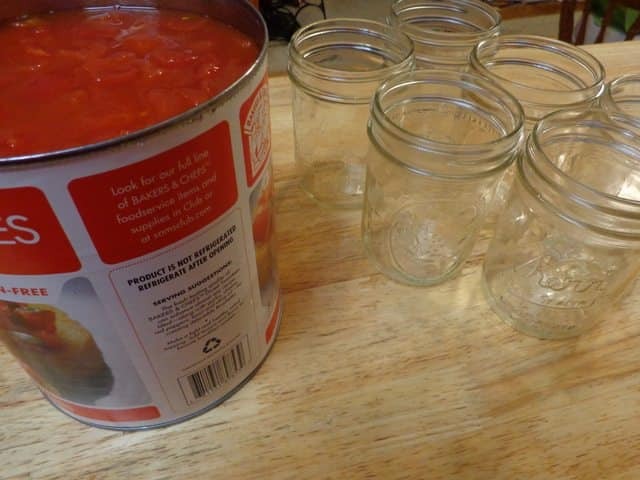 Am going to see what is in our area for canned tomatoes, that is a great idea and who knew about using canning jars on blenders? OMG! 🙂 Thank you! I know! I was so excited when our blender fit the jars. By the way, your site is beautiful! What an amazing ministry that is. That is so kind of you! Thank you! Since I don’t have a lot of freezer space, I use plastic freezer storage bags so I can lay them flat to freeze, saves a ton of room and allows me to freeze a variety of items that save me time during the week. Plus, when I am cooking for a large group (church), I can prepare a lot of the food in advance and just put it together on the day of the feed! I still like glass jars for some things, especially if I am freezing for a longer period. like chicken, beef or turkey juice for future soup or dumplings. Freezer bags are more for short term storage. That’s a good idea, Janette. Freezer bags do take up much less room than jars. Thanks so much for sharing. These are great ideas. I would have never thought of using canning jars with the blender I didn’t even know they would fit. We usually buy in bulk especially if it’s something we know we are definitely going to eat and freeze it especially chicken and fish. Bulk is always a great way to save money. Thanks for sharing. I always fry up my ground beef and freeze it already cooked as it is usually the biggest mess maker as well as time killer in ground beef recipes. Sometimes I even add onion as I usually like beef and onion in most of my recipes. I can make spaghetti sauce, chili, tacos, beefy noodles, Beef mac & cheese, burritos all in so much less time. That is a great tip. I do that too and it is such a great time saver. Thanks for sharing. Fantastic tips…especially the rotisserie chicken idea! 😉 I’m definitely going to have to try the mason jar on the blender trick! That is so cool! I have seen those big cans of sauce and paste and thought that I could never use that much, even if it is a great price! Thanks for the great tip on freezing it! We always butcher a steer in the summer, so my freezer space is very limited. I know it takes longer to pressure can beans than to just freeze them, but if you do a full canner (and you can mix and match varieties), you won’t have to do it so often. (I just rinse them, put 1 cup dried beans per quart, add salt, boiling water to the top, and can for 90 minutes. They always turn out great!) And I read all the time about ppl who buy the gallon cans of tomatoes, ketchup, salsa, etc. and re-can the ingredients. I say all this because that is the best option for me, and it just might be that someone else out there also has freezer space limitations. Those are great ideas when you have limited freezer space, Michelle. I do can our black beans, red beans, chickpeas and navy beans and you are right is it super easy. Thanks for sharing! Make big pots of soup or spaghetti sauce and freeze leftovers. One thing that has been a tasty time and money saver for us, has been to buy chicken breasts or thighs in bulk (when they are on sale, of course).. then at home we separate them into 2 breasts per ziplock bags (nothing unusual so far..) but THEN we add about !/2 cup of marinade to each bag before sealing and freezing. This means packs of two breasts take less time to defrost and when they do, they are already flavored to our liking, so a tasty meal is mere minutes away. In addition when the weather is hot, we avoid having the oven on, so I cut the breasts into bite size chunks and stir fry them with the veg of our choice or just cook solo and serve with salad (otherwise we would bake the breast whole with potatoes and roasted veg). THAT is a great idea, Teresa! Thanks so much for sharing. 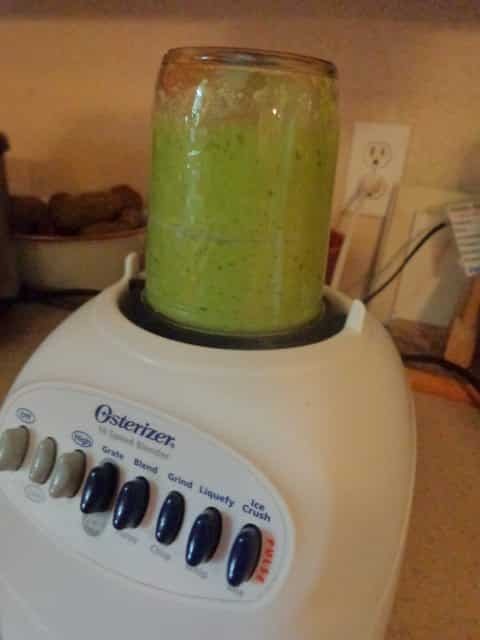 This is going to sound like a very stupid question, and I apologize in advance, but if you put a wide mouth jar upside down on your blender, how do take it off without spilling the contents. Do you turn the blender upside down and twist it off? Hi Judy, there are no stupid questions! You take the jar with the blades attached off the blender, just like you would take the blending carafe off. But instead of the blades being on the bottom and a lid on the top that you remove to pour out your goodies, you turn the jar over so that the blade component is on top and then twist it off. Hope that makes sense?